Twenty-four-year-old Eric Marshall arrives on Prince Edward Island to become a substitute schoolmaster, even though he has a bright future in his wealthy family's business. Eric has taken the two-month teaching post only as a favor to a friend - but fate throws in his path a beautiful, mysterious girl named Kilmeny Gordon. With jet black hair and sea blue eyes, Kilmeny immediately captures Eric's heart. But Kilmeny cannot speak, and Eric is concerned for and bewitched by this shy, sensitive mute girl. For the first time in his life, he must work hard for something he wants badly. And there is nothing he wants more than for Kilmeny to return his love. 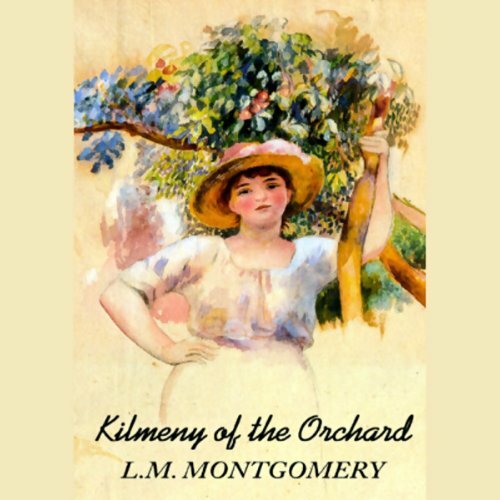 In true Montgomery fashion, a cute little story with simplicity, old-fashioned charm and romance. While not quite at the level of "Rilla of Inglesides" or "Anne of Green Gables", this is a pretty decent little romantic story of triumph over personal adversity. Like every Montgomery tale I've read, this is set in the Maritime Providences. I love Grace Conlin's voice. It is deep, musical and marvelously plays Lucy Maude Montgomery's wind in tree tops, the smell of flowers, the scent of spring, color of sunset clouds, the royal splendor of apple blossoms, feel of rain drops on one's face and the sparkle of dew in the morning sunlight. Montgomery attention to nature reminds me a bit of Elizabeth von Arnim's books such as "The Enchanted April", "The Solitary Summer" and "Elizabeth's German Garden". One is aware of every tiny breeze and the perfume of the smallest flower. Their stories are so restful, the humor is gentle and romance is tenderly unobtrusive. I know that my next statement will get me in trouble but I boldly go on because I tell only the truth. Today, Kilmeny Gordon's handicap would be viewed as a positive attraction to most men. Indeed, one would be willing to pay extra for the benefit of a silent wife. Ah...blessed peace and quiet at home. One would never have to know what the neighbors are doing. It is interesting to see how our attitudes have changed in the last hundred years. Far from being an outcast, Kilmeny would be a positive star today. Even then, most of the obstacles in this story were in the mind. I am with Eric Marshall, the hero, I think they could have been braved and subdued. The book itself is excellent, but the narrator kills me. I'm an L.M. Montgomery fan and collector of her 1st editions. Having visited Prince Edward Island, I never met anyone who spoke with the Southern accent with which Ms. Conlin narrates the book. The most distracting thing was the mispronunciation of Kilmeny. It's KIL-mah-nee not Kill-many! If you have never read this book before, skip the audio and go for the text. This is a delightful story about Eric Marshall, who falls in love with a beautiful girl named Kilmeny Gordon, who is unable to speak. Honestly, this one is outdated in that it really wouldn't be published as it is by today's standards. But it is certainly recognizable as an LM Montgomery story as the descriptions are lush and vibrant, and the story is wholesome and enjoyable. I particularly love that Montgomery includes the details about Kilmeny thinking herself cursed because of her mother's romantic choices, and how Eric shows her that she is not cursed at all. Grace Conlin is a wonderful narrator for this story. With charm and grace, you are transported back to another time period..
Good for young and old..